Sydney Zirkle is pictured with her overall grand and reserve champion dairy cows. Jessica Cook (left) and Raegan Jones (front) with their grand and reserve champion Jerseys, respectively. Also pictured is Laura Pullins. Allison Barber (second from left) won grand champion showman. Coltin Parker (third from left) won reserve champion showman. The 2018 Meigs County Fair Queen, Mattison Finlaw (left), and the First Runner-up, Raeven Reedy are pictured with the showmen. Sydney Zirkle is pictured with her grand and reserve champion Holsteins. 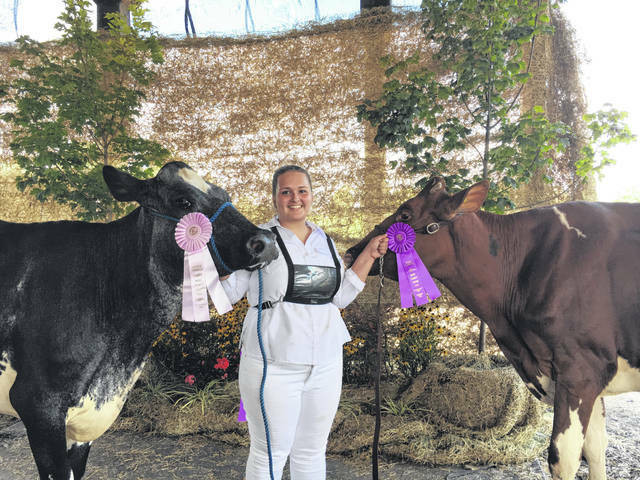 ROCKSPRINGS — Sydney Zirkle swept the Junior Fair Dairy Show on Monday morning by winning Overall Grand and Reserve Champion. Zirkle’s three-year-old Holstein cow took Overall Grand Champion after being awarded grand champion Holstein. The Overall Reserve Champion award went to Zirkle’s aged Milking Shorthorn. 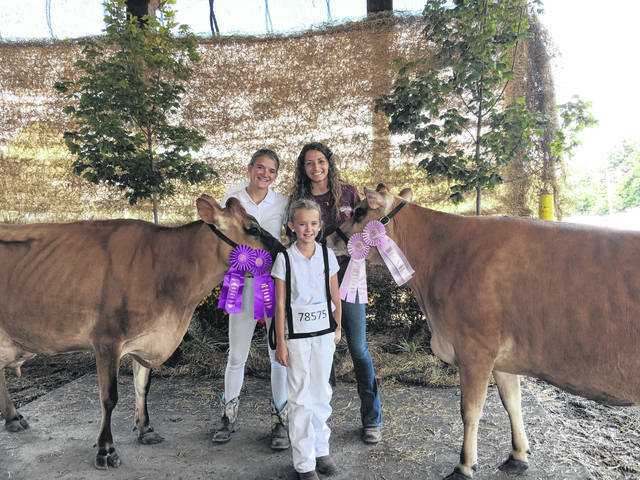 In the Junior Fair Dairy Showmanship competition, Allison Barber took grand champion and Coltin Parker took reserve champion. Parker won grand and reserve champion Brown Swiss with his spring heifer calf and his summer yearling heifer. 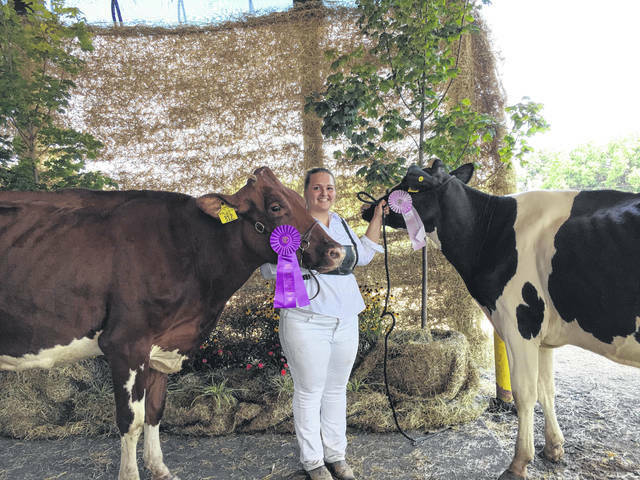 Zirkle won grand and reserve champion Holstein with her three-year-old cow and her senior two-year-old cow. Jessica Cook won grand champion Jersey with her aged cow. Raegan Jones was awarded reserve champion with her dry cow. Zirkle won grand champion shorthorn with her aged cow. Other 4-H dairy showmen who participated in the show Monday were Mattison Finlaw, Olivia Yost, Lucas Finlaw, Annie McGrath, Caelin Seth, Grace Butcher, and Kaylin Butcher. https://www.mydailysentinel.com/wp-content/uploads/sites/14/2018/08/web1_8.14-DS-1-Zirkle-overall-_ne2018813182858869.jpgSydney Zirkle is pictured with her overall grand and reserve champion dairy cows. https://www.mydailysentinel.com/wp-content/uploads/sites/14/2018/08/web1_8.14-DS-2-Jerseys_ne201881318291955.jpgJessica Cook (left) and Raegan Jones (front) with their grand and reserve champion Jerseys, respectively. Also pictured is Laura Pullins. https://www.mydailysentinel.com/wp-content/uploads/sites/14/2018/08/web1_8.14-DS-3_ne201881318295721.jpgAllison Barber (second from left) won grand champion showman. Coltin Parker (third from left) won reserve champion showman. The 2018 Meigs County Fair Queen, Mattison Finlaw (left), and the First Runner-up, Raeven Reedy are pictured with the showmen. 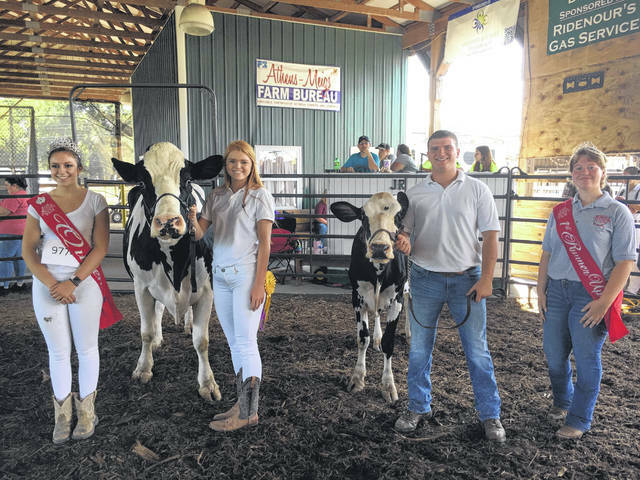 https://www.mydailysentinel.com/wp-content/uploads/sites/14/2018/08/web1_8.14-DS-4_ne201881318298361.jpgSydney Zirkle is pictured with her grand and reserve champion Holsteins.